Massive rotator cuff tears in active patients with minimal glenohumeral arthritis remain a particular challenge for the treating surgeon. For patients with irreparable rotator cuff tears, a reverse shoulder arthroplasty or a tendon transfer are often performed. However, both procedures have rather high complication rates and debatable long-term results, particularly in younger patients. Therefore, patch-augmented rotator cuff repair or superior capsule reconstruction (SCR) have been recently developed as arthroscopically applicable treatment options, with promising biomechanical and early clinical results. For younger patients with irreparable rotator cuff tears wishing to avoid tendon transfers or reverse total shoulder arthroplasty, both patch-augmentation and SCR represent treatment options that may delay the need for more invasive surgery. Keywords: Joint-preserving surgery, massive rotator cuff tear, patch-augmentation, rotator cuff repair, rotator cuff tear, superior capsule reconstruction. The success of surgical rotator cuff repair has been associated with a number of factors including size of the tear, tendon quality, degree of retraction, and fatty infiltration . Massive rotator cuff tears in active patients with minimal glenohumeral arthritis remain a particular challenge for the treating surgeon. If the rotator cuff tear is not able to be repaired, often, a reverse shoulder arthroplasty or a tendon transfer is performed; however both procedures have rather high complication rates and debatable long-term results, particularly in younger patients. Arthroscopic treatment options for patients without significant glenohumeral arthritis include debridement with or without a biceps tenotomy or tenodesis, partial rotator cuff repair, graft augmentation or interposition, or superior capsule reconstruction. These options can either be performed as bridging procedures, delaying the need for more invasive surgery in young and active patients, or as definitive solutions for patients with severe comorbidities to avoid higher perioperative risks associated with reverse shoulder arthroplasty or tendon transfers. Given the significant failure rate of massive rotator cuff repairs , patch augmentation materials have been developed to enhance the strength of the repair and increase healing potential. A variety of patch augmentation materials have been developed and used clinically, including degradable [3, 4] or non-degradable [3, 5] synthetic scaffolds, and extracellular matrix-based patches [6-12]. Generally speaking, patch-augmented rotator cuff repair is indicated for patients with massive, retracted rotator cuff tears with relatively healthy muscle and poor tendon quality. This often occurs in revision settings after a prior failed rotator cuff repair. Preoperative magnetic resonance imaging (MRI) usually provides a good idea on size of the tear and degree of tendon retraction (Fig. 1) as well as muscle atrophy and fatty infiltration. 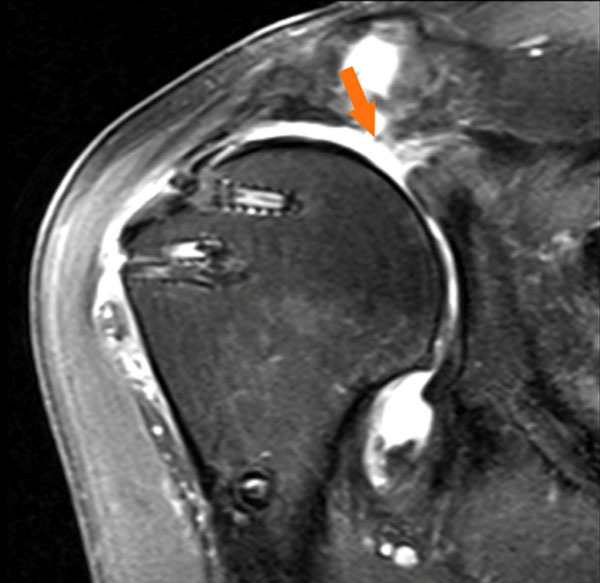 MRI (coronal view, T2) of a right shoulder, demonstrating a massive, retracted rotator cuff re-tear following previous double-row rotator cuff repair. However, the ultimate decision upon reparability of a rotator cuff tear can usually only be made intraoperatively. Arthroscopic assessment of native rotator cuff tissue quality and mobility in a right shoulder (same patient as Fig. 1) viewing from the lateral portal. The tendon can be mobilized to the greater tuberosity, but is thin and of poor quality after 2 previous failed rotator cuff repairs. Following the administration of a regional interscalene block and the induction of general anesthesia, the patient is placed in the modified beach-chair position with a pneumatic arm holder. Standard posterior and anterosuperior portals are established. Diagnostic arthroscopy is performed and all intra-articular pathologies are addressed. An accessory lateral portal is established to allow for access to the subacromial space. Mobility of the torn cuff tendons is assessed and intra- and extra-articular releases are performed using an arthroscopic shaver and a radiofrequency probe. At this point, after assessing both mobility and quality of the native rotator cuff tissue, the decision is made whether to perform rotator cuff repair with or without patch augmentation (Fig. 2). Any retained sutures and suture anchors from previous surgeries are then removed. If subacromial impingement is suspected, a subacromial bursectomy and acromioplasty are performed. Rotator cuff repair with patch augmentation is then performed using either an open or arthroscopic technique according to the size and configuration of the tear. For the open approach, a deltoid-splitting approach is utilized. The greater tuberosity footprint is then debrided to a bleeding surface using a motorized shaver. Crescent-shaped tears are mobilized and repaired directly to the medial footprint. For U- and L-shaped tears, a margin convergence technique is used to close the defect from medially to laterally. Regarding the patch material, we prefer human acellular dermal extracellular matrix patches impregnated with growth factors, glycosaminoglycans and proteoglycans as graft augmentations. Allografts are usually used as augments to reinforce the native rotator cuff tissue, not to bridge over tendon defects. The allograft patch is trimmed to match the planned area of augmentation. 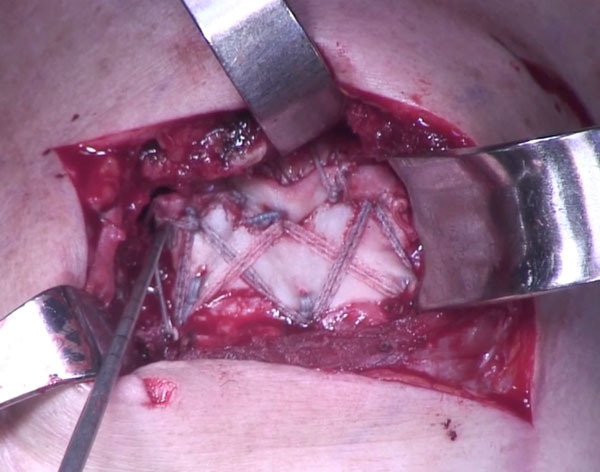 We prefer to perform the augmentation using an interconnected, linked double-row technique with suture tapes according to the method described by van der Meijden et al. . The medial row on the humeral footprint consists of usually 3-4 knotless suture anchors loaded with a no.2 tip retention suture and a 2-mm suture tape. One strand of both the suture and the suture tape are passed through the native rotator cuff using a suture lasso or other shuttling device. The sutures are tied using a horizontal mattress stitch which anchors the medial suture anchors to the remaining cuff tissue (Fig. 3). Bird´s eye view on the deltoid-splitting approach in a right shoulder (same patient as Figs. 1 and 2), with medial row anchors in place and repair of the native rotator cuff tissue to the medial aspect of the footprint. Additional tagging sutures are placed in the lateral aspect of the allograft and the suture tapes are passed through the medial aspect of the allograft. The graft is then pushed into position and incorporated into the double-row repair using the linked suture tapes from the medial row to the lateral row over the top of the entire construct (Fig. 4). This technique compresses the graft on top of the native tendon from its bursal surface and completely covers the greater tuberosity footprint. Most often, 3 anchors are placed medially and 3 anchors laterally (Arthrex, Speedbridge Kit, Naples, FL) (Fig. 4). Platelet-rich plasma (PRP) can be injected into the rotator cuff repair site at the end of the procedure, depending on the surgeon´s preference. Bird´s eye view on the deltoid-splitting approach in a right shoulder (same patient as Figs. 1-3), with final construct in place. An acellular dermal matrix allograft patch is integrated into the 6 anchor bridging double-row rotator cuff repair. Several cadaveric studies have investigated the biomechanical properties of patch-augmented rotator cuff repairs [13-16]. Increased gap formation has been proposed to impede healing at the tendon-bone interface . Shea et al. reported a reduction of gap formation at the tendon-bone repair site during cyclic loading by 40% for an extracellular matrix xenograft-reinforced repair (1.3 mm) compared to a standard rotator cuff repair (2.1 mm). The load to failure also increased with the augmented repair (429 N vs. 335 N) . These findings were confirmed by McCarron et al., who also demonstrated a decreased gap formation when using a fascia lata-autograft as patch augmentation material. Furthermore, all augmented repairs in their study completed the cyclic loading protocol, while one third of the non-augmented repairs failed . Hence, these biomechanical studies suggest that patch augmentation may facilitate healing of the rotator cuff tendon by decreasing gap formation. In a recent biomechanical study by van der Meijden et al. that created a massive tear model, patch-augmented double-row repairs could restore the repair strength back to a normal state in which the supra- and infraspinatus were intact, but the augmentation did not increase the load to failure compared to the non-augmented double-row repair. It is important to note that the rotator cuff tendons were of normal quality . As in all cadaveric studies, the time zero component with the inability to account for biological healing effects has to be noted and biomechanical in vivo results may differ remarkably from the cadaveric findings. While the majority of studies have reported patch augmentations to be advantageous, further research is needed to determine the true benefit of patch augmentations and the best way to fix the grafts. In an early randomized clinical trial from 2006, Iannotti et al. used a porcine small intestine submucosa patch to augment repairs of large and massive chronic rotator cuff tears. They found no improvement of healing rate or clinical outcomes for patch-augmentation compared to normal rotator cuff repairs . However, favorable clinical outcomes have been reported in several subsequent studies with patches made of other materials. These conflicting results suggest that the type of patch seems to influence outcomes. Synthetic absorbable [3, 4] or non-absorbable [3, 5] patch materials have been investigated, with significant postoperative improvements in ASES and UCLA scores. Mori et al. compared arthroscopic partial rotator cuff repair to fascia lata-autograft-augmented rotator cuff repair for large to massive rotator cuff tears with a mean follow up of 35 months. Patients who underwent the patch-augmentation had significantly better mean postoperative Constant scores and American Society of Shoulder and Elbow Surgeons (ASES) scores compared to the partial repair group. Additionally, retear rates detected on MRI were 8.3% in the patch-augmentation group and 41.7% in the partial repair group . This study suggests that patch-augmented rotator cuff repair may lead to enhanced healing and improved clinical outcomes compared to partial repair. An acellular human dermal matrix allograft was used by Bond et al. , Wong et al. , Barber et al. , all of them reporting promising clinical results postoperatively. Similar significant improvements in clinical scores were observed for porcine dermal xenografts as used by Gupta et al. and Giannotti et al. . In light of the considerably high rate of retears after patch-augmented rotator cuff repair for irreparable rotator cuff tears, superior capsule reconstruction (SCR) has recently been proposed as a promising new tool providing superior stability [19, 20]. Structurally, the shoulder joint capsule, including the superior capsule statically stabilizes the glenohumeral joint . The superior capsule attaches to a significant portion of the greater tuberosity , and is often concomitantly torn when the supra- and infraspinatus tendons are torn . Ishihara et al. recently demonstrated in a biomechanical study that a deficient superior capsule increased glenohumeral translation in all directions, particularly superior translation at 5° and 30° of abduction . In a cadaveric study, Mihata et al. intially reported that a simulated tear of the supraspinatus tendon significantly increased superior translation of the humerus, increased subacromial contact pressure, and decreased the glenohumeral compression force . Subsequently, they compared superior glenohumeral stability for simulated irreparable rotator cuff tears and repairs. 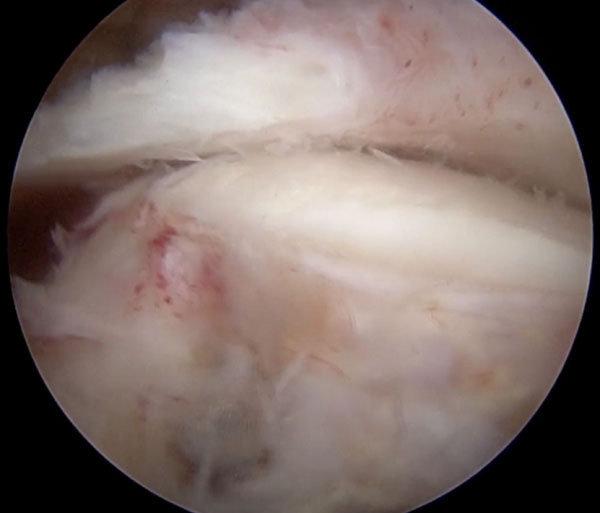 They demonstrated that superior glenohumeral translation was restored partially after applying a patch graft to the supraspinatus tendon, while translation was fully restored after applying the patch to reconstruct the superior capsule. The authors concluded that the patch should be attached medially to the superior glenoid instead of the supraspinatus tendon stump, and laterally to the greater tuberosity to restore superior stability of the humeral head . Arthroscopic view (left shoulder, view from the posterolateral portal) showing a massive rotator cuff tear. Surgery is performed under general anesthesia with an additional interscalene nerve catheter. The patient is placed in the beach-chair position. Standard posterior and anterosuperior portals are established and diagnostic arthroscopy is performed. Extensive debridement of the remaining cuff tissue back to stable margins is performed. Once the irreparable rotator cuff tear is confirmed (Fig. 5), the size of the tear is determined in the sagittal and coronal planes with an arthroscopic ruler. The greater tuberosity and the superior glenoid are prepared with a motorized shaver or rasp in order to enhance graft-to-bone healing. A Neviaser portal is established and drilling for the first glenoid anchor is performed. A knotless anchor loaded with suture tape (3.5 mm Swivelock anchor with Fibertape, Arthrex Inc., Naples, FL) is inserted at the 12 o´clock position of the glenoid. 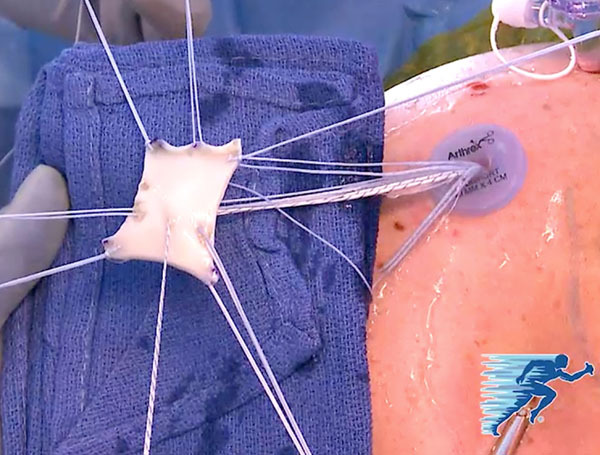 A knotless bridging double-row repair is used for the lateral, humeral side fixation (Speed Bridge kit, Arthrex, Naples, FL), The first knotless anchor loaded with suture tape is inserted at the anteromedial aspect of the rotator cuff footprint, adjacent to the articular cartilage margin. Next, the posteromedial anchor is inserted for the medial row fixation. All suture strands are then retrieved and pulled through the anterolateral portal. The greater tuberosity is microfractured in an effort to enhance graft-to-bone healing. Next, a human acellular dermal allograft (3 mm Arthroflex, Arthrex, Naples, FL) is prepared, according to the arthroscopic measurements of the defect. The sutures are shuttled through the patch at appropriate intervals according to intra-articular measurements. The edges of the graft are secured with addtional tagging sutures, fixed in a cinch-configuration (Fig. 6). The human acellular dermal allograft is prepared ex vivo using the suture tapes from the median glenoid anchor and the medial humeral row of anchors, as well as additional tagging sutures in a cinch-configuration. 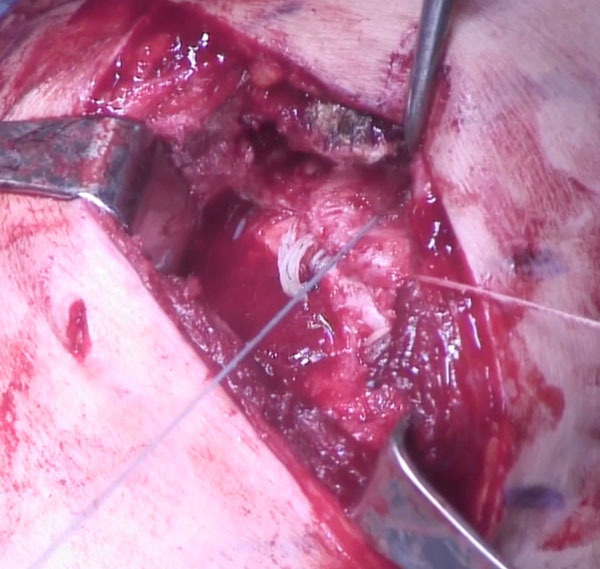 The patch is then introduced into the shoulder via the anterolateral portal with an arthroscopic knot pusher. The sutures are then retrieved through the corresponding portals. 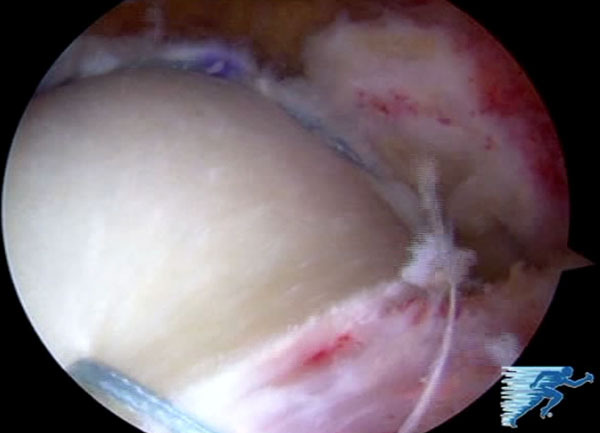 Arthroscopic view (left shoulder, view from the posterolateral portal, same patient as Figs. 5 and 6) on the glenoid fixation of the final construct of the superior capsule reconstruction. In order to definitively fix the graft medially, two more knotless suture anchors (3.5 mm Labral Swivelock, Arthrex Inc., Naples, FL) are then loaded with the suture tape strands from the previously inserted median glenoid anchor and a cinch suture from the medial aspects of the graft. These two anchors are then inserted into the glenoid at approximately the 10 o´clock position, and the 2 o´clock position, respectively (Fig. 7). The native rotator cuff tissue is then attached to the graft using the tip retention sutures from the medial row anchors. For larger tears, a third anchor loaded with suture tape can be added between the two previously placed medial anchors to complete the medial row, finally resulting in a 6-anchor-repair. The graft is then fixed laterally onto the greater tuberosity. The lateral row anchors each connect two suture tape strands of the medial row anchors. The final construct is then visualized via the lateral portal and stability of the construct is assessed from both the bursal (Fig. 8) and articular side. This assessment is also repeated during a dynamic examination of the shoulder. Arthroscopic view (left shoulder, view from the posterolateral portal, same patient as Figs. 5-7) on the humeral fixation of the final construct of the superior capsule reconstruction. In the only clinical study on SCR outcomes, Mihata et al. reported the clinical outcomes of arthroscopic superior capsular reconstructions in 23 patients with a mean age of 65 years with irreparable rotator cuff tears . They used a fascia lata autograft, which was fixed medially to the glenoid superior tubercle with a single row of suture anchors, and laterally to the greater tuberosity using a double-row technique. The graft was linked to the infraspinatus posteriorly and the anterior supraspinatus or subscapularis anteriorly with side-to-side sutures in order to restore anterior and posterior force couples. After a mean follow-up of 34 months, the ASES score had significantly improved from 23.5 preoperatively to 92.9 postoperatively. Shoulder muscle strength also significantly improved and the acromiohumeral distance significantly increased after surgery. MRI findings indicated that 83% of the shoulders did not have re-tears or graft tears. Additionally, no patients showed progression of osteoarthritis or rotator cuff muscle atrophy . Representing a cross-over procedure between patch-augmented rotator cuff repair and superior capsule reconstruction, Gupta et al. suggested sewing a human dermal allograft into the native tendon instead of anchoring it to the superior glenoid medially, creating a bridging interposition reconstruction for irreparable massive rotator cuff tears. In a prospective observational study of 24 patients, they reported significant improvements in pain, range of motion, and strength at an average 3-year follow-up. The average ASES score improved from 66.6 preoperatively to 88.7 points postoperatively. Ultrasound determined that 76% of the reconstructions were fully intact at final follow-up [9, 23]. In theory, their kind of bridging reconstruction with the graft sutured to the remaining tendon medially may be able to better restore strength and active range of motion compared to the superior capsule reconstruction, where the graft is anchored to the superior glenoid medially. However, concerns about the quality of the native tissue and potential long-term medial pull-out failures remain. For younger patients with irreparable rotator cuff tears wishing to avoid tendon transfers or reverse total shoulder arthroplasty, both patch-augmentation and SCR represent promising treatment options. Several case series have reported promising clinical outcomes for patch-augmented rotator cuff repair. Additional basic science studies are needed to better understand the biological factors associated with the healing of rotator cuff repairs in order to further improve augmentation materials. Superior capsule reconstruction appears to be an emerging solution when even a partial repair and patch-augmentation are no longer feasible. This technique has been reported biomechanically to restore almost normal glenohumeral kinematics. Further clinical trials are needed to investigate the long-term benefit of this technique as well as to determine the best indication for this procedure. Ciampi P, Scotti C, Nonis A, et al. The benefit of synthetic versus biological patch augmentation in the repair of posterosuperior massive rotator cuff tears: a 3-year follow-up study. Am J Sports Med 2014; 42(5): 1169-75. Proctor CS. Long-term successful arthroscopic repair of large and massive rotator cuff tears with a functional and degradable reinforcement device. J Shoulder Elbow Surg 2014; 23(10): 1508-13. Encalada-Diaz I, Cole BJ, Macgillivray JD, et al. Rotator cuff repair augmentation using a novel polycarbonate polyurethane patch: preliminary results at 12 months' follow-up. J Shoulder Elbow Surg 2011; 20(5): 788-94. Bond JL, Dopirak RM, Higgins J, Burns J, Snyder SJ. Arthroscopic replacement of massive, irreparable rotator cuff tears using a GraftJacket allograft: technique and preliminary results. Arthroscopy 2008; 24(4): 403-409. e1. 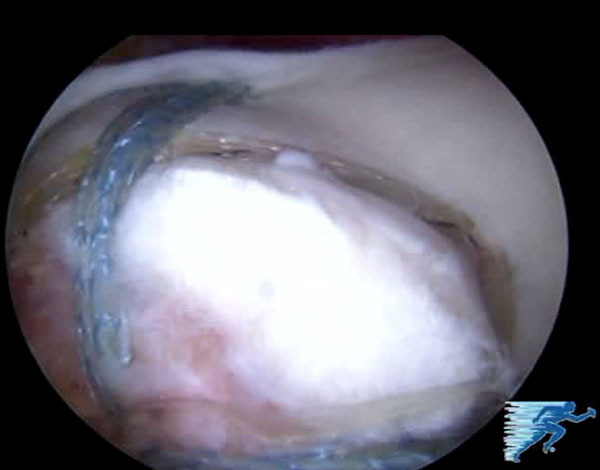 Wong I, Burns J, Snyder S. Arthroscopic GraftJacket repair of rotator cuff tears. J Shoulder Elbow Surg 2010; 19(2 Suppl): 104-9. Barber FA, Burns JP, Deutsch A, Labbe MR, Litchfield RB. A prospective, randomized evaluation of acellular human dermal matrix augmentation for arthroscopic rotator cuff repair. Arthroscopy 2012; 28(1): 8-15. Gupta AK, Hug K, Boggess B, Gavigan M, Toth AP. Massive or 2-tendon rotator cuff tears in active patients with minimal glenohumeral arthritis: clinical and radiographic outcomes of reconstruction using dermal tissue matrix xenograft. Am J Sports Med 2013; 41(4): 872-9. Mori D, Funakoshi N, Yamashita F. Arthroscopic surgery of irreparable large or massive rotator cuff tears with low-grade fatty degeneration of the infraspinatus: patch autograft procedure versus partial repair procedure. Arthroscopy 2013; 29(12): 1911-21.
 van der Meijden OA, Wijdicks CA, Gaskill TR, Jansson KS, Millett PJ. Biomechanical analysis of two-tendon posterosuperior rotator cuff tear repairs: extended linked repairs and augmented repairs. Arthroscopy 2013; 29(1): 37-45. Giannotti S, Ghilardi M, Dell’osso G, et al. Study of the porcine dermal collagen repair patch in morpho-functional recovery of the rotator cuff after minimum follow-up of 2.5 years. Surg Technol Int 2014; 24: 348-52. Beitzel K, Chowaniec DM, McCarthy MB, et al. Stability of double-row rotator cuff repair is not adversely affected by scaffold interposition between tendon and bone. Am J Sports Med 2012; 40(5): 1148-54. Shea KP, Obopilwe E, Sperling JW, Iannotti JP. A biomechanical analysis of gap formation and failure mechanics of a xenograft-reinforced rotator cuff repair in a cadaveric model. J Shoulder Elbow Surg 2012; 21(8): 1072-9. Baker AR, McCarron JA, Tan CD, Iannotti JP, Derwin KA. Does augmentation with a reinforced fascia patch improve rotator cuff repair outcomes? Clin Orthop Relat Res 2012; 470(9): 2513-21. McCarron JA, Milks RA, Mesiha M, et al. Reinforced fascia patch limits cyclic gapping of rotator cuff repairs in a human cadaveric model. J Shoulder Elbow Surg 2012; 21(12): 1680-6. Ishihara Y, Mihata T, Tamboli M, et al. Role of the superior shoulder capsule in passive stability of the glenohumeral joint. J Shoulder Elbow Surg 2014; 23(5): 642-8. Nimura A, Kato A, Yamaguchi K, et al. The superior capsule of the shoulder joint complements the insertion of the rotator cuff. J Shoulder Elbow Surg 2012; 21(7): 867-72. Gupta AK, Hug K, Berkoff DJ, et al. Dermal tissue allograft for the repair of massive irreparable rotator cuff tears. Am J Sports Med 2012; 40(1): 141-7.